Beebe Healthcare Recognizes Patrick Carmody with January 2018 L.O.V.E. Beebe Healthcare is proud to recognize Patrick Carmody, Lead Security Officer, as the January 2018 recipient of the Living Our Values Every day (L.O.V.E.) Award. In 2015, Beebe created a system of values, which every team member pledges to follow. As a patient or visitor at Beebe, you may see these value statements posted. We invite you to help us be mindful of our values as we care for you and your family members. Patrick was nominated by Sheleigh Parziale of the Guest Relations team after she observed Patrick taking special care of a couple who were waiting for a ride home. Patrick demonstrates the Beebe values by acting with passion and love for others to make a difference. Great job, Patrick! 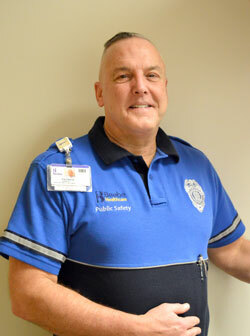 Caption: Patrick Carmody, Lead Security Officer at Beebe Healthcare, is the January 2018 recipient of the LOVE Letter Award.